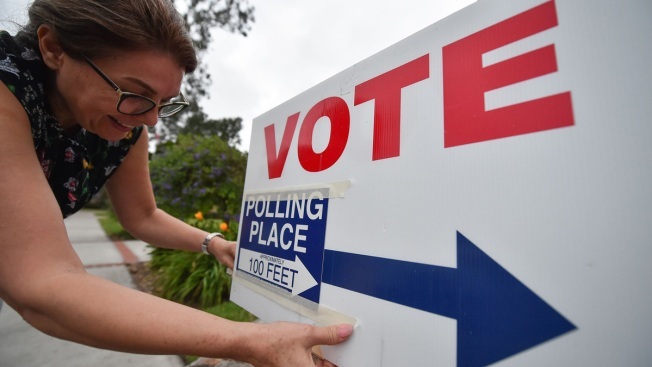 This file photo shows a poll worker in Laguna Beach, California, on Nov. 6, 2018. The 2018 midterms remade Congress for the next two years, but they also hinted at a changing electoral map for the next presidential race. Broad gaps in exit poll numbers combined with the results for Nov. 6 suggest that the battleground states of 2020 may look a bit different than they did in the 2016 campaign, NBC News reported. Three numbers jump out of the national House exit poll data: The Republican edge with white voters, the growing Democratic advantage with voters who hold a bachelor's degree and the consistent Democratic lean among Hispanics. Ohio had two Republican-held competitive House seats in 2018 - one "tossup" and one "lean Republican" according to the Cook Political Report - and both wound up going for the Republican candidate fairly comfortably. And in the state's gubernatorial race, an open seat to replace Republican John Kasich, the GOP's Mike DeWine won in a race that, again, was forecasted as a tossup. With a population that is 79 percent white, non-Hispanic, Ohio stands far above the national average of about 61 percent. The percentage of people with a bachelor's degree, about 27 percent, is three points below the national average. And the Hispanic population, about 4 percent, is 14 points below the national figure. In short, on the factors that mattered in the exit polls, Ohio looks Republican. So much so, that the perpetual battleground seems less and less likely to be in play in 2020.